You can use these databases to pinpoint the finer examples of your chosen time period, but here's a brief overview. 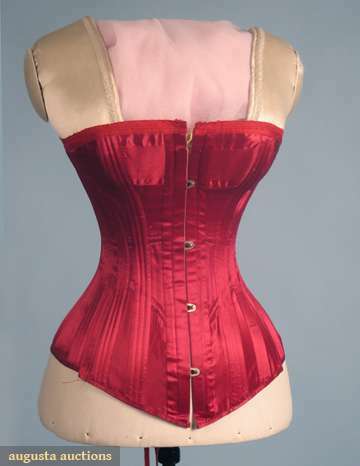 Keep in mind we're working with generalizations, and you'll always be safer researching your own examples of the corset you'd like to make. 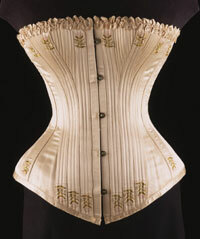 Starting in 1900 the "healthy corset" movement introduced a new straight-front corset that had more extreme seaming and stiffer boning in front to give less restriction to the rib cage. 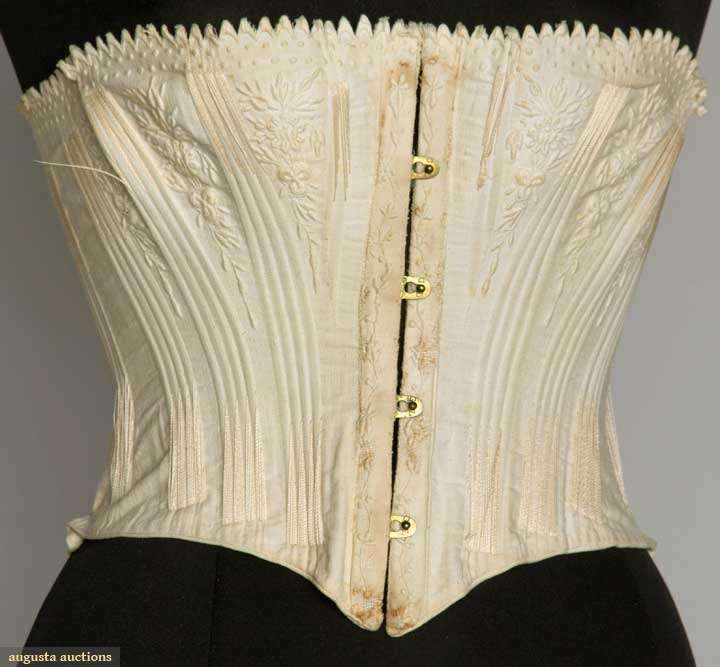 However, women quickly discovered that this new corset style could be laced much tighter than the old ones, and quickly adopted it to dangerous degrees. 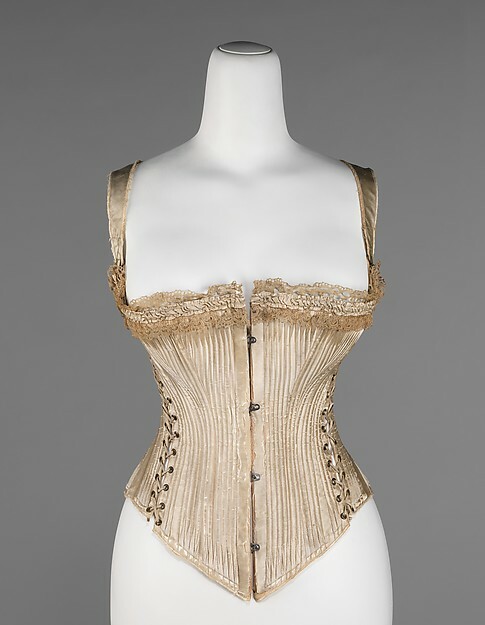 These corsets are constructed much like the corsets of the 1850-1900s, but require much more care in fitting and styling, so they're not really appropriate for a first corset. 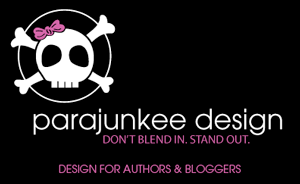 As you can see there are many variations of color and color combinations possible. Are there any styles that stick out to you already? What time period are you aiming for? 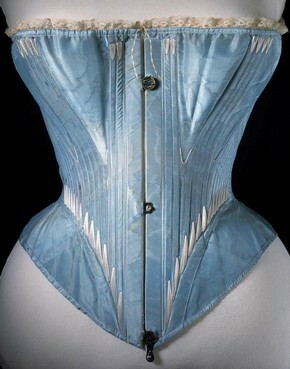 I love the second one, the light blue with the beautiful stitching. 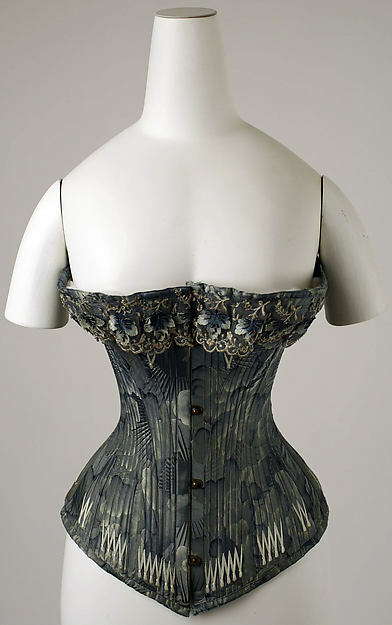 Early 1860s is my goal. Is that one appropriate for then? Yes! 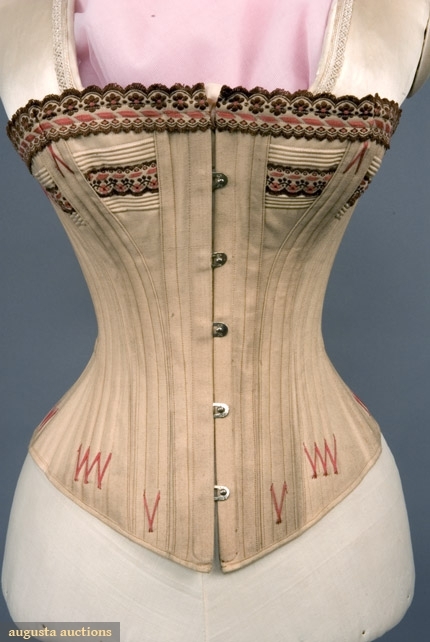 We won't be doing separate hip gores like that one has, but you can still achieve something very similar with good fabric and trim choices. Great, I'm looking forward to working on this! It's funny, I like the examples that are either prior to our period of inquiry (geometric cone bodies) or after (s-shaped edwardians). I guess it's because these are least like the body I already have. I have been hearing all week about Lionel Shriver's new novel, _Big Brother_, which explores obesity. 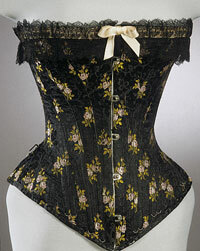 ....That said, I have a kit for Laughing Moon's corset, but I don't remember if it's the Silverado or the Dore. I bought it at Grannd Companies several years ago. It has moved several times from house to house and I'll need to figure out if I still have all the bones or not. I might like to slightly tea-dye the fabric and I would like peach colored trims and topstitching. That sounds really pretty, I look forward to seeing it!